Digital marketer Steve Mulvaney explains how to gain new patients via search engine advertising. We are all familiar with typing in the white box in the centre of a search-engine home screen such as Google, Bing or Yahoo. Often we are seeking information, products and services or just answers to simple questions that make us go ‘hmmm?’. 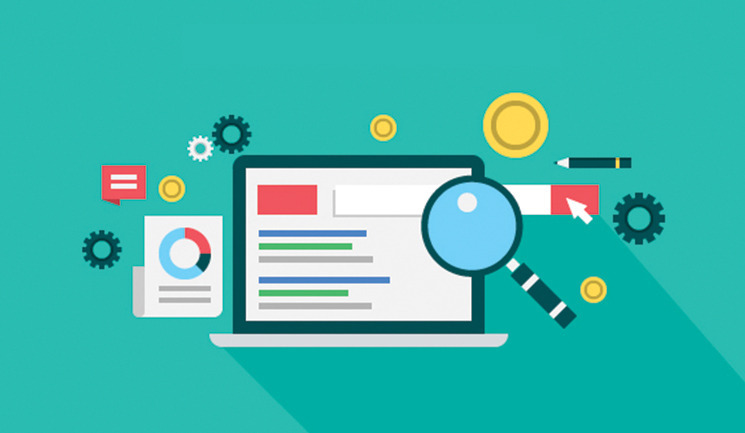 As a user, while searching online, we may not always be aware that search engines are a tool driven by intent and the top four results generated are often companies that have paid to be there. As a clinic business owner or marketing manager, you need to know whether potential patients are actively looking online for services you provide. It’s important to understand your patients’ intent through their online search queries to maximise your opportunity to win new patients. 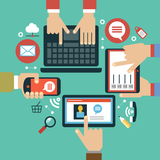 Understanding your patients’ intent is particularly important if you’re running paid ads. In this article, I will explain what search intent is, the basic types of search intent and how to ensure your digital marketing efforts are focused on delivering highly targeted, high value traffic to your website. Technically speaking, search intent can differ slightly between organic – results that are based on relevance – and paid results; our focus here is primarily on paid ads. Why use paid search ads? Carrying out a search on your own services will show you just how competitive those search result positions really are. If you’re not visible at the top of the search page, then your competitors are likely to be getting those potential patients and leads that could otherwise be yours. To know something: usually the answer to a specific question, such as ‘what is’, ‘how do’, ‘where are’. These are also known as ‘informational’ searches. An example would be when a patient searches ‘what are hyaluronic acid dermal fillers?’. To go somewhere: typically includes searches about a specific website or business without entering the full URL or brand name with the intent of finding that particular website or webpage. Also known as ‘navigational’ searches, an example could be if someone searched ‘Aesthetics journal’ with the intent of going to the Aesthetics journal website. To do something: searches which include keywords such as ‘buy’, ‘quote’ or ‘book’ alongside ‘online’, and including specific product-related searches. These are referred to as ‘transactional’ searches. An example would be when a patient searches ‘book lip filler treatment’. Commercial investigation: this is used when someone is searching for product comparisons, price comparisons and product/service reviews. An example would be when a patient searches ‘laser hair removal cost comparison’. To strive toward getting the very best results from your paid ad platform using these search intent types, you should consider your service offering as a funnel. The transaction searches, the ones which will get you profit, are at the bottom of the funnel i.e. they’re likely to be the final step before a searcher, or patient, becomes an enquiry. Being at the bottom of your funnel, this searcher will have the highest value to your practice. The potential downside to this is that they’ll also have the lowest volume – there will always be more people browsing items in a shop than those who actually end up making a purchase. It’s worth remembering that in the online world, your patient will see you long before you see them. For this reason, it can be a good idea to appear in some searches in the commercial investigation stage too. As we’ve already touched on, these kinds of searchers are actively looking for a solution to their particular issue; but, they’ve not yet made their final decision as to who they wish to purchase from. You may also wish to consider your options for searchers who fall under the ‘go somewhere’ and ‘know something’ categories. For ‘go somewhere’ you may find that searches on your URL place you high on organic search, and you certainly stand a greater chance of this if you’ve also invested in SEO. Also, if your brand name is a direct match to your URL, running a paid search campaign focused on your brand name should also serve your website at the top of the search results. Whether or not you wish to appear for ‘know something’ type searches can be down to personal preference and/or budgetary constraints. This is because, typically speaking, they don’t contribute directly to a booking or enquiry but can influence a searcher’s decision to make that booking. For example, if I run an acne treatment clinic I may have blog posts or a frequently where I can answer informational type questions. I may find that answering these questions leads some searchers to read other pieces of content on my site and may therefore influence that person to enquire about, or book, my services. The flipside of this is that the same searcher may well click on my ad, consume my content, then look elsewhere online for another practice that can satisfy their needs. Not only will I have lost a potential patient, but my ad budget has been depleted too. Let’s consider a typical journey from the perspective of a patient. An individual may firstly have a requirement or desire for a particular treatment, such as ‘anti-wrinkle injections’. They will then decide to search for solutions online. They may firstly do this when they are on the go via their mobile device and they will visit several relevant websites along the way, engaging more with some than with others. A couple of days later, they may continue their search – perhaps on a desktop computer during a lunch break at work. They could recall some of the websites they visited earlier and engage with those sites again. Their search query may differ slightly – for example ‘anti-wrinkle procedures’ – and they’re presented with a mix of ads they’ve seen previously, along with some new ads, followed by the organic listings that will appear below these. Finally, on the weekend they have the opportunity to search again, maybe this time in front of the TV using their tablet device. They are likely to have a more refined search query that’s closer to one showing purchase intent, such as ‘anti-wrinkle procedures Edinburgh’. If this point is the first time you’ve served an ad to this person, there’s a chance you’ll be clicked on and this person could become a patient. But, other practices that might also have ads previously at other stages may also appear in this search, which could draw the searcher to them and away from you, as they’ve already had some level of engagement from the prospective patient. So, how is it possible to appear above the competition and pay less than them per click? This is because the major search engines want to deliver the most relevant results possible to their searchers. If the path between the initial search query and the page that the searcher lands on when they click your ads is highly relevant, then you can appear above a less relevant result and pay less per click. The actual cost you’ll pay per click is usually determined by the competitiveness of the keywords in your account. Therefore, it’s not unusual to find that keywords showing transactional or commercial investigation intent can be the most expensive in your account.4,5 These are more competitive because they’re bringing in new business for you and your competitors. The takeaway message here is to ensure your paid ad account is first and foremost structured to serve ads for search queries that show transactional (purchase) intent, so I would recommend putting the majority of your budget in this area. As well as transactional intent, you should also consider the value in having a smaller budget allocated to ads for some searches which show commercial investigation intent. Deciding upon your ad budget can be a confusing task as there are seemingly endless variables in your decision-making process. Generally speaking, having a much smaller budget (if any) for searches that show informational intent will also be advantageous. However, it depends on how much you would like to spend, and I would recommend first placing your budget in the transactional and commercial investigation intent categories first. 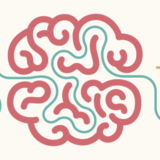 In simple terms, you are free to choose any words (for your keywords) that are in common use. There are restrictions on offensive words, adult content and counterfeit goods etc, as well as restrictions on copyrights and trademarks. 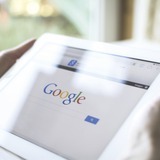 You should also consider the restrictions on healthcare and medicines, all of which are covered in Google’s Advertising Policies.6 Consider how you could use relevant keywords that a searcher might use when looking for services you provide. I would almost always advise against using a single keyword in your account as you can’t see any purchase intent. Exact match keyword: only shows an ad if the searcher typed in the keywords exactly as they appear. Phrase match keyword: shows ad if all three words appeared in the same order as the search engine keyword, but the searcher may have also used additional words either side of the keywords. Broad match modified: would be triggered if all three of the keywords are contained within a search, they can also be included in any order and with any other words used in the search. You may, on occasion, see a competitor showing ads when searching for your clinic or even your name. While this may seem ethically questionable, it is allowed. I therefore believe you should certainly monitor this and occasionally run some searches on your own brand terms. But, don’t do this too often as if you Google yourself too much then your analytics results won’t be reflective of what’s actually occurred, so you’ll skew your account performance figures with your own searches. If you do find that a competitor is using your brand name for their paid ads, then I would recommend that the first response should be a polite letter asking them to stop – getting into a bidding war on each other’s brand names on Google Ads ultimately benefits nobody. You should also strongly consider running brand campaigns on your own brand; this would involve a campaign in your account to show ads using your brand name as a keyword. In many ways, I find that this is the best response to this particular situation. More often than not, branded campaigns have a cheaper cost per click, due to the fact that they’re simply less competitive than other keywords. Finally, if you appear top organically and top of a paid-for branded search you can dominate the search results page! Let’s again consider the example of a private practice offering acne treatments. A search that shows little purchase intent would be something like the search ‘what is acne?’. On a Google search, we’d most likely see a Google Answer Box at the top of the results page giving us a useful description of the condition. We will generally also see organic links to informational articles about acne. The big giveaway around this kind of search is that there are no ads being served. So, we can reasonably deduct from this that although these search results are helpful to the searcher, they show no real intent that could lead to an enquiry or booking. Taking a step even further back, if you simply have the keyword ‘acne’ in your paid ads account, then you’ll likely receive clicks where no intent has been expressed or can be deduced. This is a quick way to exhaust your budget. However, the search ‘What is acne?’ shows a little more intent in that the searcher is clearly asking a question. What we don’t get is any sense of why they’re asking the question or even where they’re situated geographically, which may be an important detail. 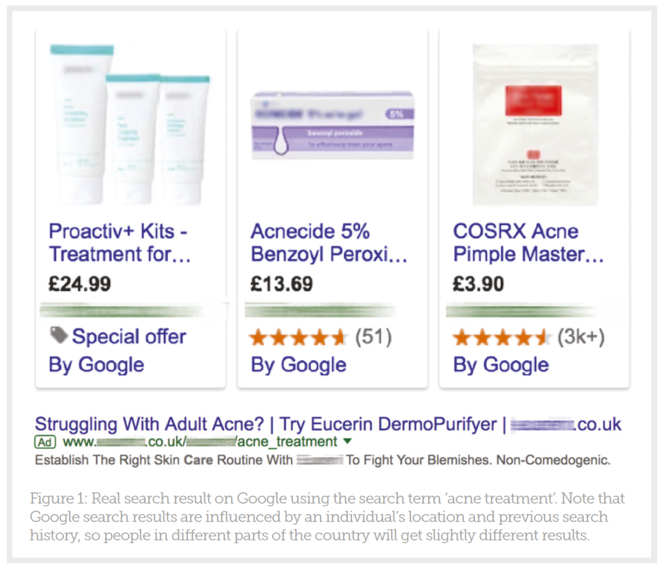 We can perhaps see an additional layer of search intent with the search ‘acne treatment’. Here we can expect to see Google Shopping results at the top of the results page showing something like Figure 1. We see the first results because companies selling off-the-shelf products will very often use the word ‘treatment’ in their product descriptions within Google Shopping. Underneath the Google Shopping results there will typically be some standard text ads offering similar solutions which are product and not service led. You can be much more confident that showing your ads for this query could generate a click to your website, which, in turn, could lead to the searcher making a booking with you and giving you a return on your ad spend investment. Committing budget to your digital marketing campaigns, particularly paid ads, can be very costly and frustrating when not done properly. Equally, when correctly structured, your paid search engine ad campaigns can be a fantastic source of patient leads each and every month. If you don’t yet have a paid ad account, it’s almost certainly something that is worthwhile investigating as a way of driving patient leads. Having a greater understanding of the searcher’s intent based on their search query can really help you to define which keywords you should have in your account. Visualising a sales funnel and structuring your account around search intent is the best way to ensure the highest return on your ad spend. Should you start paying for Google AdWords?